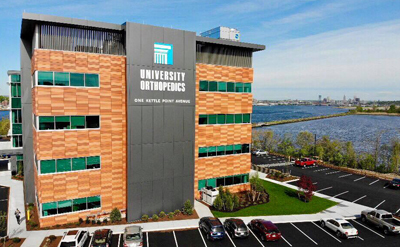 Dr. Bica joins University Orthopedics as an attending at Newport Hospital after practicing 3 years with East Greenwich Spine and Sport. Dr. Bica will serve as an assistant clinical professor in the Department of Orthopedic Surgery along with his current position as assistant clinical professor in the Department of Family Medicine at the Warren Alpert Medical School of Brown University. Dr. Bica is board certified in Family Medicine with a certificate of added qualification in Sports Medicine. Dr. Bica was born and raised in Rhode Island, graduated from Providence College, and then earned his osteopathic medical degree at the Philadelphia College of Osteopathic Medicine. Dr. Bica completed his residency and fellowship at East Carolina University and stayed on faculty as Assistant Residency Director teaching residents and medical students. Dr. Bica has been practicing in Rhode Island at East Greenwich Spine and Sport since 2014. Dr. Bica serves as the President and Education Committee Chairman of the Rhode Island Academy of Family Physicians. Dr. Bica also serves as the Secretary of the Rhode Island Society of Osteopathic Physicians and Surgeons. Dr. Bica's other interests include sports medicine research, osteopathic manipulative medicine in treatment of neck and lower back pain, fluoroscopic spinal injections, and diagnostic and interventional musculoskeletal ultrasound. Bica D, Sprouse RA, Armen J. Diagnosis and Management of Common Foot Fractures. Am Fam Physician, 2016;93(3):183-191. Bica D, Armen J, Kulas A, et al. Reliability and Precision of Stress Ultrasonography of the Ulnar Collateral Ligament. J Ultrasound Med, March 2015;34:371-376. Sprouse RA, Armen J, Bica D, et al. Effects of Environmental Conditions on the Reliability and Precision of Static Balance Assessment Using Biodex Balance Systems. Clin J Sport Med, March 2015;25(2):192-193. Bica D, Kulas A, Womack Z, Youngs K, Armen J. Relationship between Glenohumeral Internal Rotation and Medial Elbow Strain Evaluated by Musculoskeletal Ultrasound. Clinical Journal of Sports Medicine. March 2012;22(2):187. Bica D, Armen J, Niceler B. Computerized Neuropsychological Testing in the Management of Sport-Related Concussion. Athletic Training & Sports Health Care, January/February 2012;4(1): 7-10. David P. Bica, DO, CAQSM, Sports Medicine Physician with University Orthopedics Inc., and affiliated with Brown University, has been named a 2018 Top Doctor in Rhode Island. Top Doctor Awards is dedicated to selecting and honoring those healthcare practitioners who have demonstrated clinical excellence while delivering the highest standards of patient care. Dr. David P. Bica is a highly respected and experienced physician, having been in practice for many years. His career in medicine began when he graduated with his Doctor of Osteopathic Medicine Degree from the Philadelphia College of Osteopathic Medicine. After graduating, Dr. Bica completed his residency with Vidant Medical Center/Brody School of Medicine at East Carolina University, where he was an assistant residency director. Dr. Bica is board certified in Family Medicine, with a Certificate of Added Qualification in Sports Medicine. With a passion for his work, he is noted for his expertise in family and sports medicine. Dr. Bica is also regarded as a specialist in osteopathic manipulative medicine in the treatment of neck and lower back pain, fluoroscopy spinal injections, and diagnostic and interventional musculoskeletal ultrasound. Dr. Bica has earned the coveted title of Fellow of the American Academy of Family Physicians, and he also serves as an Assistant Clinical Professor at The Warren Alpert Medical School of Brown University. His meticulous approach to patient care, coupled with his dedication to his work, and contributions in his field makes Dr. David P. Bica, DO, CAQSM a very worthy winner of a 2018 Top Doctor Award.